Philadelphia has been treated as poorly as its infamous reputation by the media for the unfortunate death of hitchBOT, a social experiment with the kind of outcome that science fiction has warned us about time and again. By association, all of the United States has been criticized as well for being too violent, cold, and mean-spirited. It’s not fair to judge all by the actions of few but, as is usually the case, there are some lessons to be learned here, and as a lifelong Pennsylvanian, I believe that we should accept at least some of the responsibility. That is, when we’re all done complaining about it. The helpless robot made it across Canada, Germany and the Netherlands within a year just fine, but after just two weeks in the United States, making stops in Boston and New York, it met its untimely end in Philly on Aug. 1 when vandals trashed and decapitated it for no clear reason. Cue all the awful “City of Brotherly Love” jokes you can pack into a headline above every “told you so” commentary about violence in America and you’ve got yourself a news cycle. While it’s hard to disagree that our country has major issues with violence, with Philadelphia being a crime-filled example known for throwing snowballs at Santa Claus, many of these articles missed an important element of this story – who did this, and why? Those who last saw hitchBOT “alive” were YouTube “stars” Ed Bassmaster and Jesse Wellens, known online for their vlogs and prank videos, and while no one can prove whether or not they destroyed the innocent bot, they’ve already confirmed that they’re attention-seeking liars by releasing fake security camera footage of one of Bassmaster’ many unfunny characters, “Always Teste,” seemingly stomping hitchBOT to pieces. After they revealed it’s fake, many new sources who couldn’t be bothered to fact-check anything were forced to update with retractions, which says a lot about media these days, but also about those hoping to be featured by it. In other words, Ed and Jesse irresponsibly left hitchBOT in Old City in the wee hours of the morning, knowing full well that the area has a history of violent crime, or they smashed it and simply haven’t admitted it. Either way, they’re idiots, welcoming the five minutes of fame its brought them and milking it further with the fake surveillance video. It just so happens that Bassmaster will be getting his own “reality” prank show on CMT because, you know, we all needed another reason to skip over that channel, so instead of getting this guy cancelled before his show even begins in November, this will likely serve as one big contemptuous commercial for its premiere. Think about the enormous difference in attitudes here. The “parents” of hitchBOT, David Harris Smith and Frauke Zeller, started this social experiment in hopes of brightening spirits, making people feel good, and proving that humanity will do the right thing when it comes down to it. Bassmaster and Wellens, who screw with people for fun, learn of this experiment and immediately think, “How can I profit from someone else’s idea?” You have to be a pretty nasty, cynical person to do that, but this state (and the entertainment business) seems full of them. When I started NEPA Scene, one of my main goals was to thoroughly cover the good news, highlighting all the great people we have in Northeastern Pennsylvania doing great things. After working in corporate newspapers for the last five years, I knew this would be an uphill battle because I saw the numbers behind the scenes – if it bleeds, it reads. Bad news is discussed and shared around all day on social media, while positive feature stories, no matter how inspiring or well-written, are often ignored or barely talked about at all. While 99 percent of what NEPA Scene covers is positive, the very few negative stories we’ve published about venues closing or controversy caused by one thing or another have been some of our most read and shared. People complain all the time about the media spreading and profiting from misery, yet very few combat this by giving greater attention to positivity and progress in their communities. Thankfully, we have a very dedicated following who support us and believe in what we’re doing, but that can sometimes get drowned out in all the doom and gloom out there. 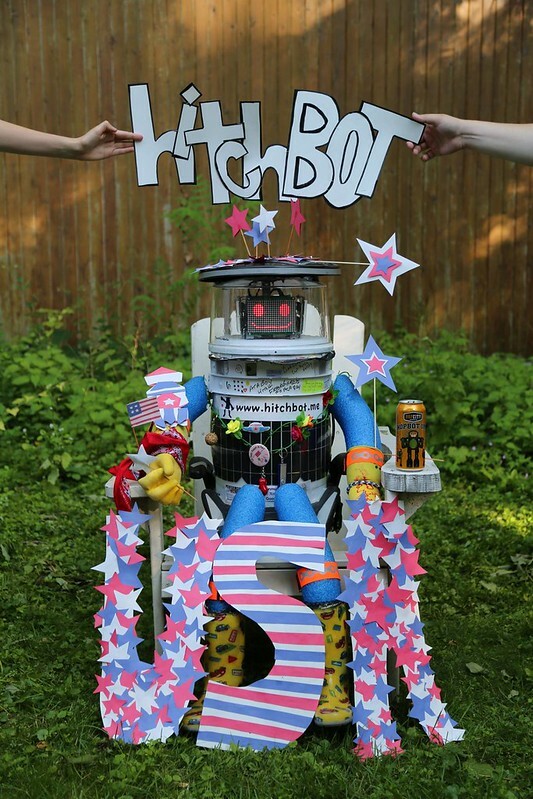 Just look at hitchBOT’s story. Despite receiving worldwide publicity for over a year now, so few in the United States knew anything about it at all, with many assuming that the whole experiment was just as made-up as the security video. When the robot’s mission ended prematurely, though, suddenly every news source in the country was covering it and everyone was sharing it, along with their condemning commentary. Sure, Philly’s Hacktory and Geekadelphia offered to help rebuild hitchBOT and send it on its way, but that was just a footnote in this attention-grabbing mishap that was only further compounded by jackasses acting like they’re on “Jackass.” Even Steve-O has taken up better causes these days. Pennsylvanians are often pessimistic, plagued by everything from political corruption and corporate greed to crazy weather and nasty potholes, and we let people know it – all the time. Many of our daily conversations are just made up of a series of complaints, one right after the other, but it doesn’t have to be this way. If more optimistic people were spreading hitchBOT’s story, would its visit to the Keystone State gone much differently? Probably. Good people likely would have been seeking hitchBOT out and picking it up for the right reasons – not to stage YouTube pranks. The world has enough wanna-be stars and not enough people allowed to shine through their own merits, but that all changes when we stop making the wrong people famous. Maybe hitchBOT would have met the same fate in another state, but at least then we would have been spared all the Killadelphia jabs. This may not have been the best social experiment ever conducted, but it’s given us food for thought. Let’s digest it this time instead of regurgitating the same old cynicism. It could just save a life, artificial or otherwise.